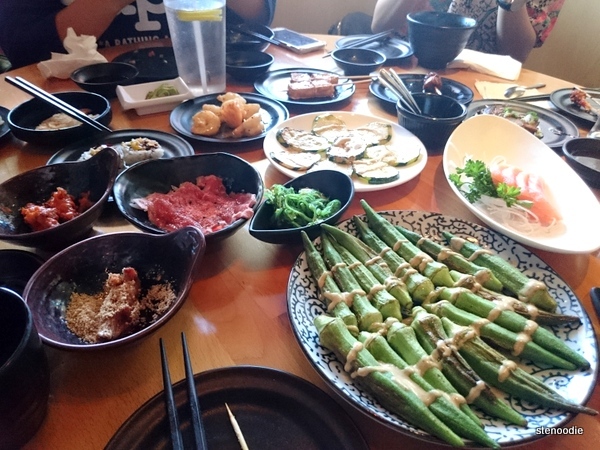 KAKA All You Can Eat is back at it again to snag the title (in my books) for having the tastiest and high quality menu items for an all-you-can-eat Japanese restaurant. KAKA All You Can Eat is located in Markham at the First Markham Place plaza near Highway 7 and Woodbine. Ever since opening in the fall of 2015, it’s been a popular place for hungry foodies to dine at this all-you-can-eat restaurant where you order the items with a iPad on your table and service is efficient and fast (reservations can sometimes take up to 2 months, so book early!). On this Monday night though, we were treated to an exclusive media preview tasting thanks to Sweven Media and the owners of KAKA All You Can Eat. 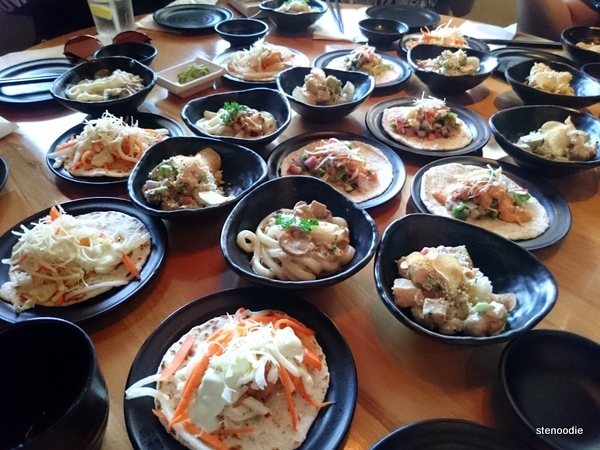 There were nine new menu items in total including three types of poke fish salad, two tacos, udon carbonara, skewer, and two desserts. I was very grateful to be able to try each new menu dish that they were going to make available starting Friday, July 22, 2016. 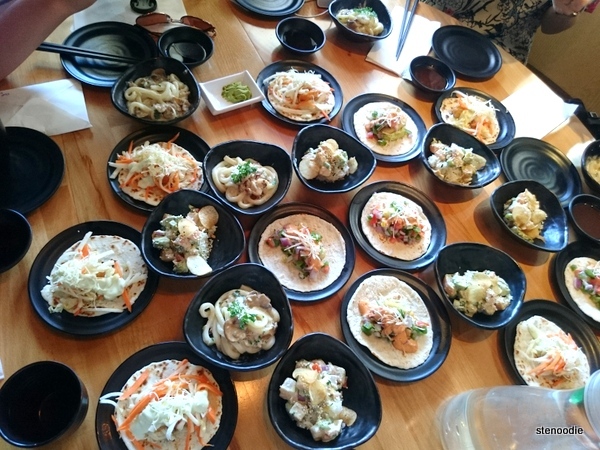 For an all-you-can-eat place, the items like the poke fish salad and tacos definitely heighten the value of what you get at this Japanese restaurant. 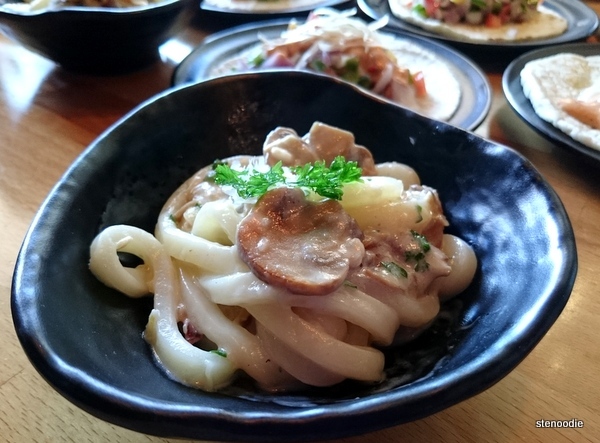 First, I tried the Bacon and Mushroom Carbonara which had udon noodles covered with creamy mushroom carbonara with bacon. The udon noodles were so slippery and smooth! I really liked this one. 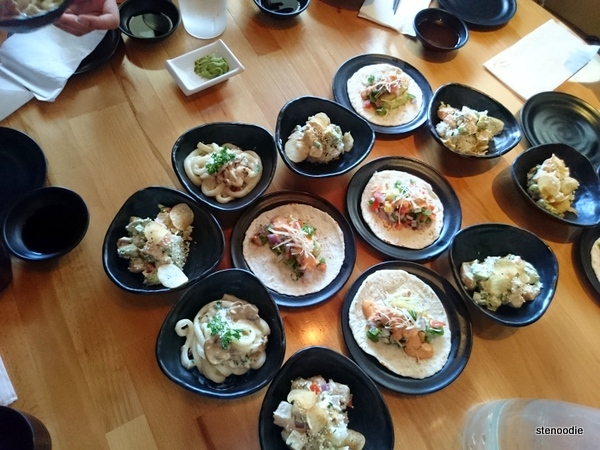 The Shrimp Taco had pico de gallo, avocado puree, and wasabi mayo. I loved how soft the tortilla was. This taco was a bit spicy too but it was delicious! 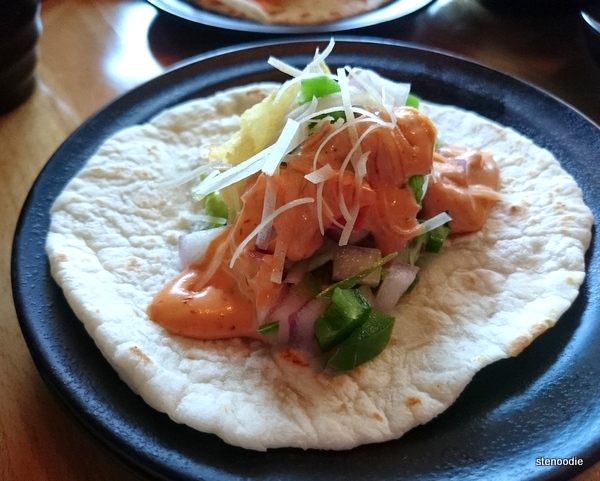 The second new taco item was the Fish Taco with an Asian slaw, avocado pure, and a chipotle mayo. Again, loved the tortilla. 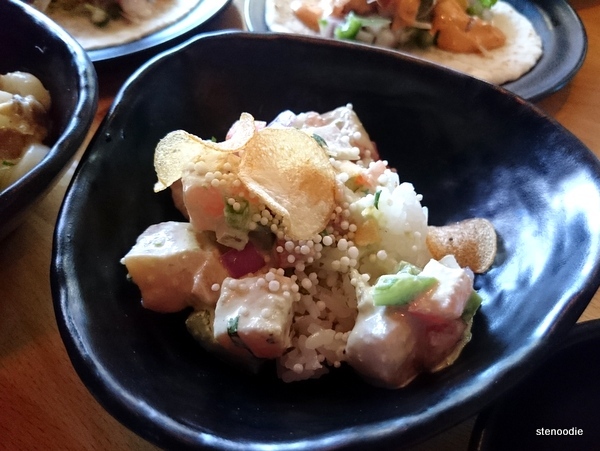 The Jalapeno Poke had salmon, avocado, jalapeno, tomato, onion, and garlic chips. These poke fish salads are small enough to try out on your own or to share with a friend. There is white rice underneath each dish in case you weren’t aware.. I liked this one as it was a bit spicy and the salmon poke was good. 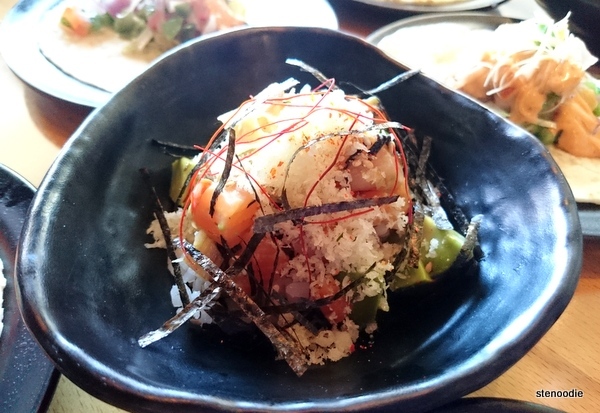 The Citrus Soy Poke had salmon, nori, sesame, avocado, cilantro, green onions, and tempura bits. Lastly, the third of the poke salads was the Yuzu Ponzu Poke. 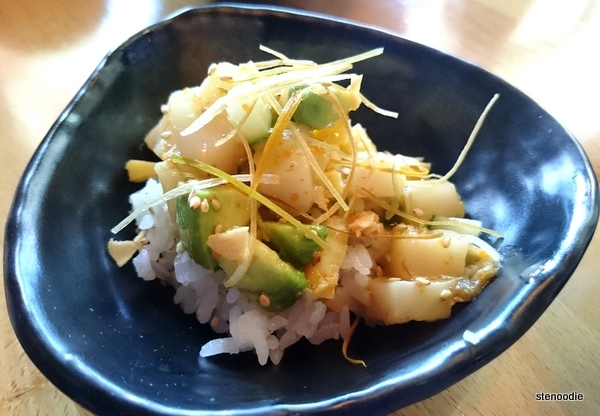 This had butterfish, cucumber, avocado, sweet egg, green onions, melon, and a yuzu sauce. 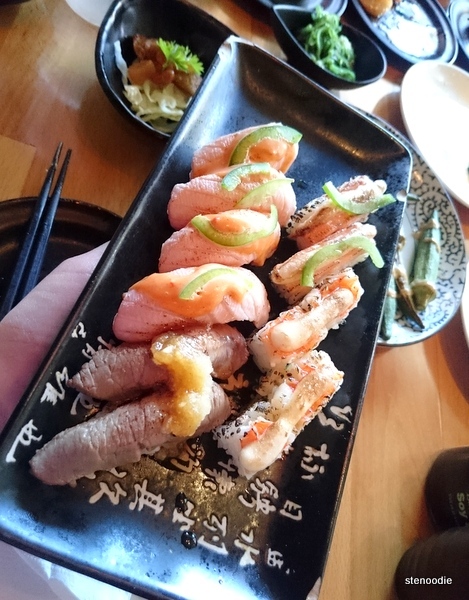 I think that this dish was definitely an acquired taste since the butterfish was a little sour due to the yuzu sauce. After we feasted on the amazing spread of the new menu items, our table freely ordered items from the regular menu as well. Our table was full of good food, our stomachs were full, and the restaurant was too. 😉 There were a lot of people here on a Monday night and it was packed! 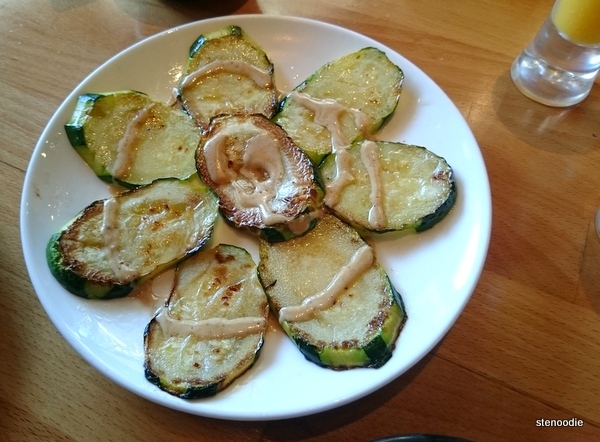 Most of us were fans of okra so we ordered a whole plate of it! Yum. I remember loving it in my first visit to KAKA All You Can Eat too. This is one of the brand new items on the list: the Chicken Meatball Skewer! 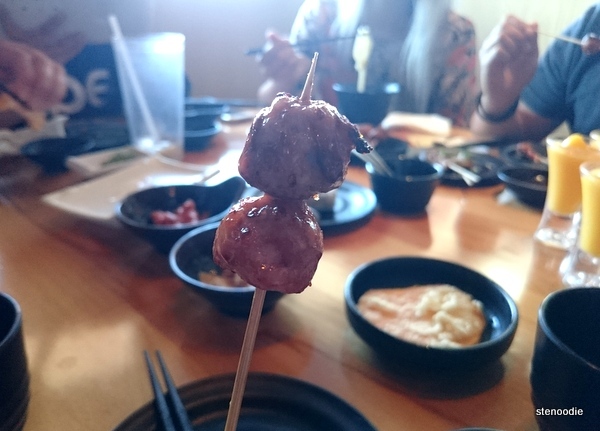 It was a nice skewer of sensational meatballs. 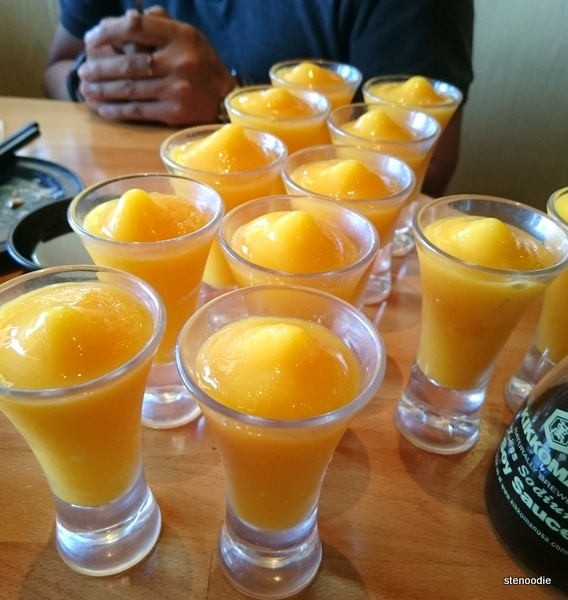 We finished off with some popular desserts like the mango slush — some of our friends had fun by taking it all like a shot — and the two new desserts, Passion Fruit Pineapple Yogurt and Lychee Panna Cotta. 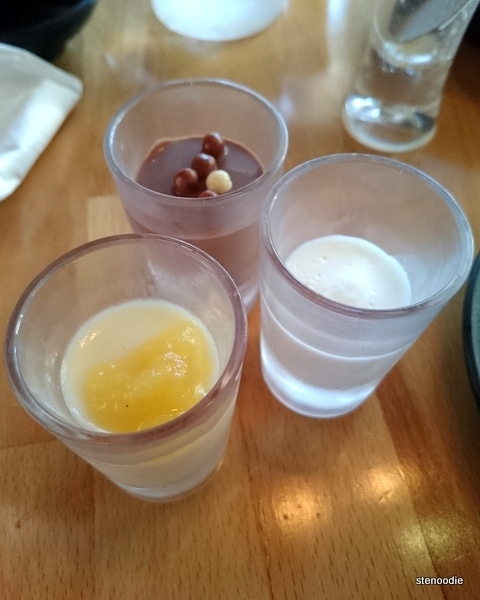 I liked the Passion Fruit Pineapple Yogurt more than the Lychee Panna Cotta. I really liked how the Passion Fruit Pineapple Yogurt was a tiny tad tart and tart enough to help me digest all the food we had. Mmm, delicious mango slush! These were brilliantly made and tasted perfectly sweet. There were two for each person during the first round and then we ordered a second round of mango slushes too. That’s how good they were. 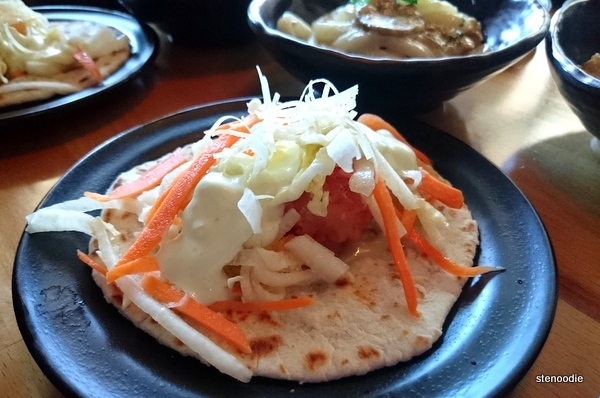 FTC Disclaimer: Although Sweven Media invited me to a complimentary tasting to showcase the new menu at KAKA All You Can Eat, the opinions expressed here represent my own and not those of the companies. This entry was posted in Complimentary Adventures, Food and tagged 3235 Highway 7 East Unit 18A, @KaKaAYCE twitter, @swevenmedia twitter, all-you-can-eat, Bacon and Mushroom Carbonara, Chicken Meatball Skewer, Citrus Soy Poke, First Markham Place, fish taco, food blog, foodie, Jalapeno Poke, Japanese, Japanese restaurants in Markham, KAKA All You Can Eat, Lychee Panna Cotta, Mango slush dessert, Markham, new menu items at KAKA All You Can Eat, ordering sushi with iPads, Passion Fruit Pineapple Yogurt, restaurant review, Shrimp Taco, torched sushi, Yuzu Ponzu Poke, Zucchini. Bookmark the permalink.